Cañada Road is a popular and easy road ride in the Peninsula. 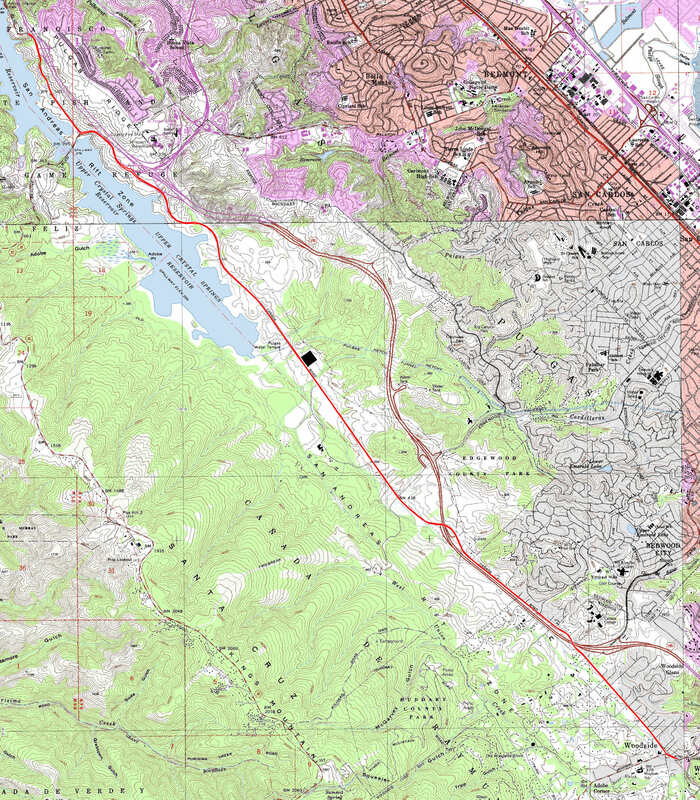 This version of the ride is an out-and-back that covers only Cañada Road itself, with a brief extension onto Skyline Boulevard (only its portion that's adjacent to I-280). Most stretches of this route see little motor-vehicle traffic, with the notable exception being the brief segment on Route 92. The ride also presents some nice views of the Crystal Springs Reservoirs (which can be downright poetic, if you do your ride on a misty early morning) and provides the opportunity to stop at a couple of attractions that may not be familiar to those who aren't local to this area. The ride starts right from the southern tip of Cañada Road at the main intersection of the Woodside town center. Note that the businesses near this intersection have some parking lots, but they all feature signs limiting parking to shoppers. It's not guaranteed that you'll get in trouble the very first time you'd park at one of these lots for your bike ride here, but it's probably a safer bet to do the more civilized thing by obeying the restrictions and opting to park on the roadside along Woodside Road as pointed out at the parking link on your left. An alternate place to park is along the roadside at the northern end of Cañada Road near its intersection with Route 92. Spaces there may fill up fairly quickly, though, on weekends when the weather is good. It doesn't take too many directions to follow this ride route. You take Cañada Road all the way to its northern end at the intersection with Route 92, continue on 92 to the intersection with Route 35, and follow 35 up to where it's closed due to some dam construction. Then retrace your path all the way back. At least, that's how it turned out in the case of this particular ride that was done at a time when there is some work going on at the Crystal Springs Dam. Ordinarily, it would be natural to take Route 35 all the way to the entrance of the Crystal Springs Golf Course (where Route 35 switches to following along on the eastern side of I-280 instead), adding almost four more miles to this round trip. Riding on Cañada Road is very safe. There's a generous paved shoulder along the entire length of the road and the traffic is light. The part about the light traffic stops being true along the short stretch of this route that's on Route 92, though the bit about the shoulder still holds true. Once you make it onto the Skyline Boulevard (Route 35) portion of the ride, the road narrows considerably and the shoulder mostly disappears, though the traffic also diminishes once again. One important thing to know about Cañada Road is Bicycle Sundays. Every Sunday, the portion of Cañada Road between the Filoli entrance and Route 92 is closed to motor-vehicle traffic between 9:00 AM and 3:00 PM and reserved for use by bikers, joggers, walkers, and skaters. Depending on the type of rider you are (casual or serious) you might be interested in coinciding your ride here with that, or in trying to avoid it. One of the two attractions along Cañada Road to which I've alluded above is the historic Filoli Estate. The house and gardens here are open to public tours. The other attraction, Pulgas Water Temple is a more unusual one. This is a monument that marks the end of the aqueduct that brings water to San Francisco from the Hetch Hetchy Reservoir in the Sierras and where it feeds into the Crystal Springs Reservoirs. I find it quite striking that such civic pride was felt in that bygone era about an engineering achievement that it prompted people to build a Greco-Roman-inspired monumental structure to celebrate it. Today, in practice, this is a pretty little park and one of the nicest potential rest stops you could find on any bike ride. If you stop there, don't neglect to take a close look at the structure and read the inspirational inscriptions incorporated into its design. Possibilities for extending a road ride on Cañada Road are limited only by one's imagination, time, and stamina. One of the more popular options (and one that won't require you to dedicate most of your day to your ride) is to take Route 92 southwest from the northern end of Cañada Road to the ridgetop stretch of Skyline Boulevard, follow that southeast, and then to descend back to Woodside by taking a left turn either on Kings Mountain Road, or Route 84, or Old La Honda Road. One advantage of starting and ending the ride in downtown Woodside is that it gives you several good options for a post-ride meal or refreshments. Buck's Restaurant is worth a try even just for the quirky (and genuinely interesting) artifacts that are displayed on its walls and hanging from its ceiling. Meanwhile, The Village Bakery sells a good selection of breads and pastries, and is therefore a good destination for some coffee, in addition to featuring an adjoining restaurant with a full menu. And those are not the only ones.